Crude Oil Daily: Reports warn of trouble signs in Ghana's new oil sector. 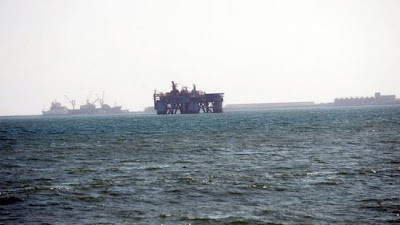 Reports warn of trouble signs in Ghana's new oil sector. ACCRA (AFP) – Ghana looked to defy the trends which have plagued other west African oil producers, replacing graft and waste with prudent spending, but two years after production began there is reason to worry, new reports said. The country's nascent energy sector may yet transform its economy and has thus far been unmarred by the sort of rampant corruption and mismanagement typical of Nigeria, Africa's largest producer, whose vast oil wealth has been squandered for decades. But plans to carefully spend oil revenue on infrastructure, debt payments and agricultural development have not been well executed so far, according to a new study from the Accra-based Africa Centre for Energy Policy. "I think on the quiet we are really moving towards the way Nigeria has really spent its oil revenues. And if it goes unchecked, that is where we are going," said Benjamin Boakye, a co-author of the report. Of the $287 million (214 million euros) in oil revenue Ghana devoted to public spending in 2012, 18 percent went to non-productive administrative departments like the office of the president, the report said. Meanwhile, key infrastructure projects have been short-changed, with upgrades to roads and bridges unfinished because the state failed to fully fund them, according to the think tank. Boakye said by thinly spreading oil revenue over a number of projects which cannot be completed within a reasonable period of time the government is not giving people value for money. Ghanaian officials did not respond to requests for comment. The think tank's criticism comes amid gloomy economic news for the nation of some 25 million people, also a major producer of cocoa and gold. Its currency, the cedi, has plummeted against the dollar, and while the economy grew by 7.9 percent last year, spending has been tightened after costly presidential polls last year and worse-than-anticipated oil production. When production began at the offshore Jubilee field in December 2010, it was expected to generate up to $1.0 billion in government revenue per year, but yielded just $444 million in 2011 and $541 million in 2012. Technical problems were said to have caused the shortfalls. Another report from Ghana's Civil Society Platform on Oil and Gas said the government had not amended its tax code to cover capital asset trades in the energy sector, meaning the country has lost out on $67 million in potential revenue. These are small sums, especially compared to the example set by west African giant Nigeria, which loses roughly $6 billion each year to oil theft and pipeline sabotage, nearly 11 times Ghana's total oil income. Ghana has been producing about 110,000 barrels per day in recent months, whereas Nigeria, the world's eighth largest producer, is churning out an estimated 2 million barrels daily. But the losses could pile up if Ghana does not swiftly close loopholes in its tax code and, according to the Civil Society Platform, the lacklustre management displayed so far is cause for concern. "The companies themselves aren't doing anything illegal, they're just exploiting a lacuna in the law," said Steve Manteaw, chairman of the Civil Society Platform. "You can't blame them, they're not philanthropists, they're in business to make money," he added. The deals in question saw Ghana's EO Group sell assets to Anglo-Irish Tullow Oil, which has a majority stake in the Jubilee field. In the other deal, US-based Sabre Oil sold its stake in Tullow to South Africa's PetroSA. Some experts said it was far too soon to sound an alarm or force regional comparisons to Nigeria or even Equatorial Guinea, where the proceeds from large offshore reserves have been concentrated in the hands of the ruling family. management law that allows outside groups, including civil society, to closely track all oil spending. Christoph Wille, an analyst at London-based Control Risks, told AFP by email that despite some trouble spots Ghana still deserves praise for its energy sector management, even if some improvements are needed. "In contrast to Nigeria, I do not think that lost revenues from the oil sector highlight an endemic problem of mismanagement or corruption," he said. The problems so far, he said, are in fact "a by-product of an emerging economy trying to swiftly capitalise on the benefits of a nascent, but fast advancing resource sector." With a little more "institutional maturity" Ghana's performance will improve, he added.